A couple of lobes of deep convection are wrapping around the eyewall and will close off soon. Danielle will then have a thick eyewall which will allow for more strengthening. It appears that Danielle has turned even a little more and is almost moving north northwest. The motion is a little slower too. A hurricane hunter recon is scheduled to investigate Friday. At 9 pm edt / ast hurricane Danielle was centered near 22.0° N / 53.5° W or about 990 miles southeast of Bermuda. Top sustained winds are estimated at 95 mph (NHC 85 mph - 5 pm edt advisory). Movement is northwest at 13 mph. Pressure at 982 mb by NHC. The two lobes of deep convection last night did infact come together to make a solid eyewall. Over the past couple of hours some dry air has caused a break in the southeastern side. It appears that the eyewall is shrinking though, meaning the hurricane is getting stronger. If the eyewall closes again, it will allow Danielle to make the jump to major hurricane status as it will likely strengthen significantly. 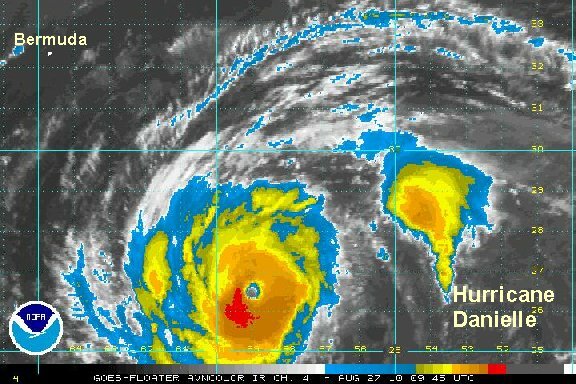 At 5 am edt / ast hurricane Danielle was centered near 23.4° N / 54.9° W or about 860 miles southeast of Bermuda. Top sustained winds are estimated at 105 mph (NHC 105 mph - 5 am edt advisory). Movement is northwest at 16 mph. Pressure at 968 mb by NHC. All interests in Bermuda: Danielle will be at its closest late Saturday into Sunday. 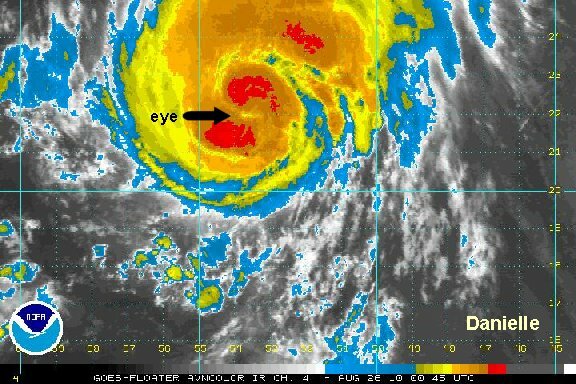 Bermuda is a small island and a direct hit from the eye is does not appear likely. Forecast models consistently have been showing Danielle turning north a day before Bermuda allowing it to move to the east. Danielle has a good chance of being a strong hurricane as it passes by allowing for significant swell to be generated. There is a good chance for tropical storms force winds late Saturday evening into Sunday as Danielle passes. Rain or rain squalls are also possible during this time, but that will be dependent on the exact size of Danielle at that point. Wave forecast models have a 10-15 foot swell predicted near or west of Bermuda Saturday into Sunday. A 20-30+ foot swell is predicted east of Bermuda where the hurricane is expected to pass over. Keep in mind that swell high predictions can change depending on the track and actual strength of the hurricane. Recent satellite imagery shows some dry air getting sucked into the circulation. This and wind shear weakened Danielle about two days ago in a similar fashion. The eyewall may be strong enough to fight it off this time though. Several more hours will tell the tale if this dry air is going to weaken the structure or not. Next full update: early-mid afternoon. Satellite imagery has confirmed that the thick eyewall has fought off the dry air intrusion. The eyewall is thickening and cloud tops cooling - all indicating a stronger hurricane. The hurricane center will likely up winds to 115 or 120 mph at 5 pm edt. 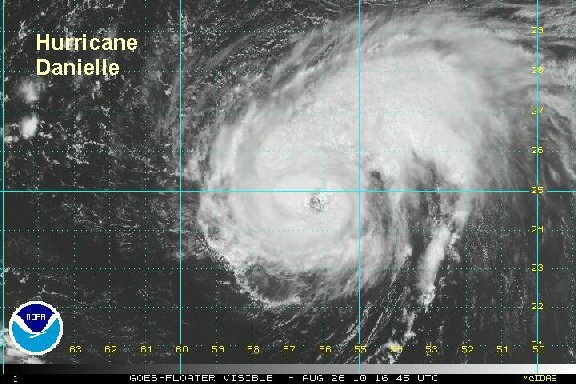 At 2 pm edt / ast hurricane Danielle was centered near 24.9° N / 56.4° W or about 720 miles southeast of Bermuda. Top sustained winds are estimated at 115 mph (NHC 105 mph - 11 am edt advisory). Movement is northwest at 15 mph. we estimate pressure at 960 mb. The overall structure of Danielle has changed little over the past 6 hours. 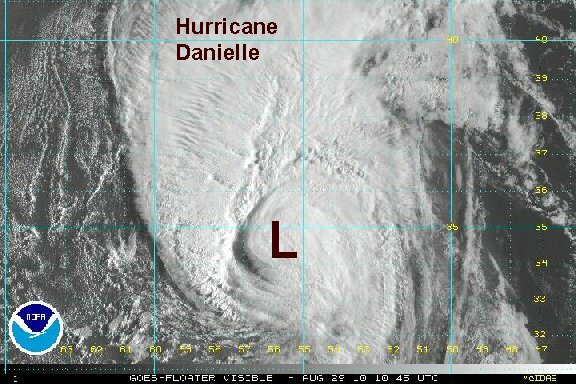 NHC surprised us and did not classify Danielle as a major hurricane. They only increased winds to 110 mph. Forecast models still are calling for a turn to the north a day before reaching Bermuda. If this trend continues the worst of the weather will pass to the east of the island. 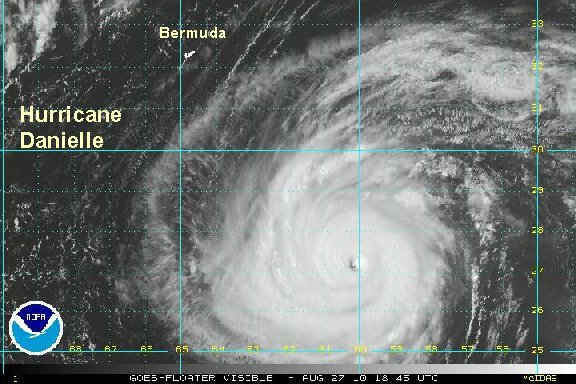 At 7 pm edt / ast hurricane Danielle was centered near 25.4° N / 57.0° W or about 670 miles southeast of Bermuda. Top sustained winds are estimated at 115 mph (NHC 110 mph - 5 pm edt advisory). Movement is northwest at 15 mph. Estimated pressure at 968 mb by nhc. All interests in Bermuda: Danielle will be at its closest late Saturday into Sunday. Bermuda is a small island and a direct hit from the eye is does not appear likely. Forecast models consistently have been showing Danielle turning north a day before Bermuda allowing it to move to the east. Danielle has a good chance of being a strong hurricane as it passes by allowing for significant swell to be generated. There is a good chance for tropical storms force winds late Saturday into Sunday as Danielle passes. Rain or rain squalls are also possible during this time, but that will be dependent on the exact size of Danielle at that point. Wave forecast models continue to have a 10-15 foot swell predicted near or west of Bermuda Saturday into Sunday. A 20-30+ foot swell is predicted east of Bermuda where the hurricane is expected to pass over. Keep in mind that swell high predictions can change depending on the track and actual strength of the hurricane. Danielle's eyewall has solidified with cold cloud tops surrounding it. The motion is still northwest with a farther west wobble last hour. This is not unusual at all to see a wobble like this as many strong hurricanes display this feature. We and the hurricane center at still nearly on the same page with strength. It is possible that the strength is up to 140 mph now as the eyewall is growing. We think 135 mph is reasonable. An air force recon hurricane hunter will visit today, telling us exactly what is going on. At the current time well to the west of Danielle seas are at 10-12 feet......40 feet near the eyewall. 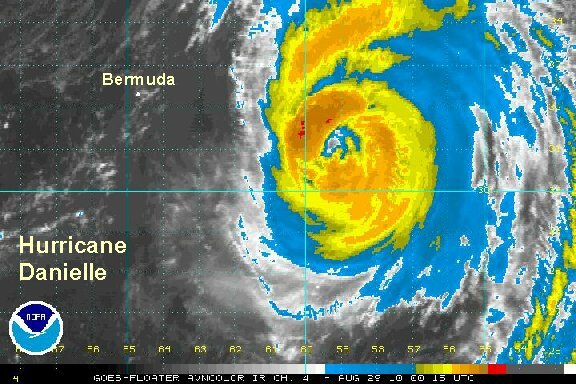 At 7 am edt / ast hurricane Danielle was centered near 26.5° N / 59.2° W or about 515 miles southeast of Bermuda. Top sustained winds are estimated at 135 mph (NHC 135 mph - 5 am edt advisory). Movement is northwest at 12 mph. Estimated pressure at 946 mb by nhc. All interests in Bermuda: Danielle will be at its closest late Saturday into Sunday. Bermuda is a small island and a direct hit from the eye is does not appear likely. Forecast models consistently have been showing Danielle turning north a day before Bermuda allowing it to move to the east. Danielle has a good chance of being a strong hurricane as it passes by allowing for significant swell to be generated. There is a good chance for tropical storm force winds (39-73 mph) late Saturday into Sunday as Danielle passes. Rain or rain squalls are also possible during this time, but that will be dependent on the exact size of Danielle at that point. Wave forecast models have slightly higher seas with a 10-20 foot swell predicted near or west of Bermuda Saturday into Sunday. A 20-40+ foot swell is now predicted east of Bermuda where the hurricane is expected to pass over. Keep in mind that swell high predictions can change depending on the track and actual strength of the hurricane. Satellite imagery shows a classic hurricane. Very significanly, models continue to insist on curving Danielle sharply tomorrow to the east of Bermuda. This will take the worst effects well east of Bermuda including the hurricane force winds. At the current time swell to the west of Danielle at 6-12 feet......50 feet near the eyewall. At 3 pm edt / ast hurricane Danielle was centered near 27.5° N / 60.0° W or about 440 miles southeast of Bermuda. Top sustained winds are estimated at 135 mph (NHC 135 mph - 11 am edt advisory). Movement is northwest at 12 mph. Pressure at 942 mb by the hurricane hunter recon. Models take Danielle east of Bermuda by about 150-200 miles late this weekend. After that, north to the north Atlantic - east of Nova Scotia, and eventually northeast. All interests in Bermuda: Danielle will be at its closest late Saturday into Sunday. Forecast models consistently have been showing Danielle turning north, then northeast tomorrow before Bermuda allowing it to move to the east of Bermuda by 150-200 miles. Danielle will be a strong hurricane as it passes by allowing for significant swell to be generated. The highest swell should stay 150-200 miles east of Bermuda. Winds may gust to 35-50 mph in rain bands late Saturday into Sunday as Danielle passes. Wave forecast models have a 10-20 foot swell predicted near or west of Bermuda Saturday into Sunday. A 20-40+ foot swell is now predicted well east of Bermuda where the hurricane is expected to pass over. Sorry for the inconvenience....friday night and saturday mornings update was eaten by the computer. 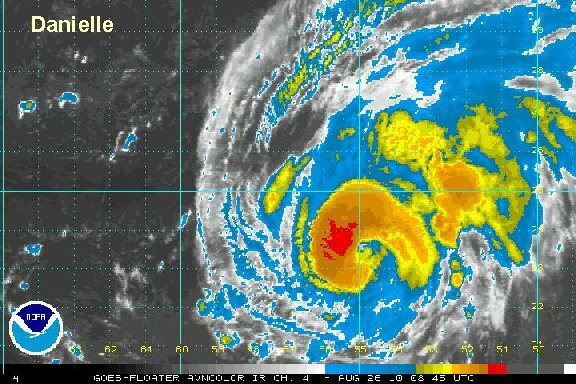 Folks visiting Bermuda may be wondering where hurricane Danielle went. Danielle started to recurve northeast a little earlier than expected. Many times there is a zone of decending air on the sides of a hurricane creating beautiful weather. That's exactly where Bermuda is today. 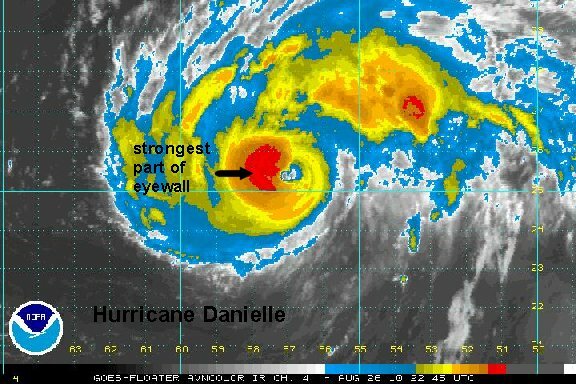 Bermuda will likely see NO effects other than high swell from Danielle. The latest radar still shows a squall band about 60 miles to the east. At the current time swell to the west of Danielle is at 9-15 feet......40 feet near the eyewall well to the southeast. It also appears that Danielle is weakening some per the last recon. 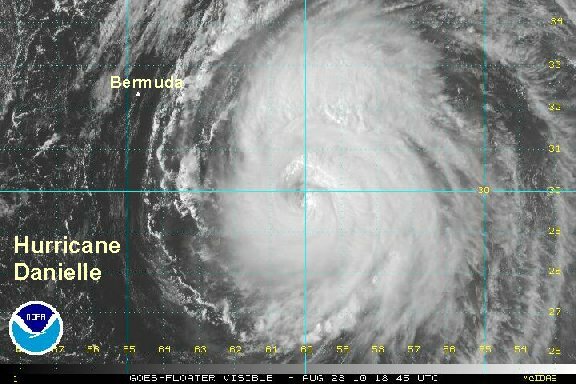 At 3 pm edt / ast hurricane Danielle was centered near 29.8° N / 60.0° W or about 325 miles southeast of Bermuda. Top sustained winds are estimated at 100 mph (NHC 110 mph -2 pm edt advisory). Movement is north northeast at 10 mph. Pressure at 950 mb. All interests in Bermuda: Danielle is now at its closest point. Any rain showers will be from a front approaching from the west. Winds will not gust higher than 25-30 mph. Danielle turned north northeast earlier late this afternoon allowing for it to move about 75-100 miles farther east than anticipated a few days ago. Bermuda will see no effects other than high surf from Danielle. Rain showers moving though are associated with a cold front moving in from the west. The eyewall has been in transition. After weakening earlier, a new thicker eyewall is building to the northwest. Pressure, a measure of a hurricane's strength went all the way up to 970 mb. Because of this we'll still estimate winds at 95 mph. At 9 pm edt / ast hurricane Danielle was centered near 31.2° N / 59.2° W or about 330 miles east southeast of Bermuda. Top sustained winds are estimated at 95 mph (NHC 105 mph - 5 pm edt advisory). Movement is northeast at 13 mph. Pressure at 970 mb. Satellite imagey confirms Danielle starting to transform into a north Atlantic gale. It will be going through the transformation over the next 1-2 days. It is also weakening and the hurricane center has dropped their winds to closely match our estimates. At 8 am edt / ast hurricane Danielle was centered near 34.7° N / 55.8° W or about 535 miles northeast of Bermuda Top sustained winds are estimated at 85 mph (NHC 90 mph - 5 am edt advisory). Movement is northeast at 21 mph. Pressure at 972 mb. Danielle is transforming into an extratropical cyclone. Danielle is not a threat except to shipping in the north Atlantic. Because of this we will not longer update Danielle.